Artists Impression of ESA’s Aeolus wind mission. Image courtesy of ESA/ATG medialab. China launched its Gaofen-11 satellite, via the Long March 4B rocket, on the 30th July from the Taiyuan Satellite Launch Centre in Shanxi Province in China – which is the next door province to Shaanxi province, the home of the Terracotta Warriors, we wrote about last week! There is little known about this satellite, which is smaller than the recent Gaofen-5 and Gaofen-6 launches earlier this year. The new satellite is reported as being a sub-metre optical satellite and has gone in a sun-synchronous orbit. The data is expected to be used for land surveys, urban planning, road network design, agriculture, and disaster relief. Goafen-11 will be part of the China High-resolution Earth Observation System (CHEOS) which, once completed in 2020, aims to provide all-day global coverage in all weather conditions. 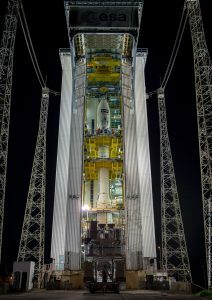 Aeolus in the launch tower. Image courtesy of ESA/CNES /Arianespace. 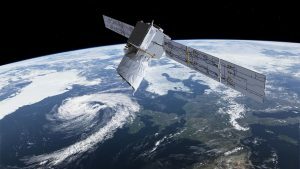 The European Space Agency’s Aeolus mission is due to lift off on the 21st August at 21.20 GMT from Kourou in French Guiana. 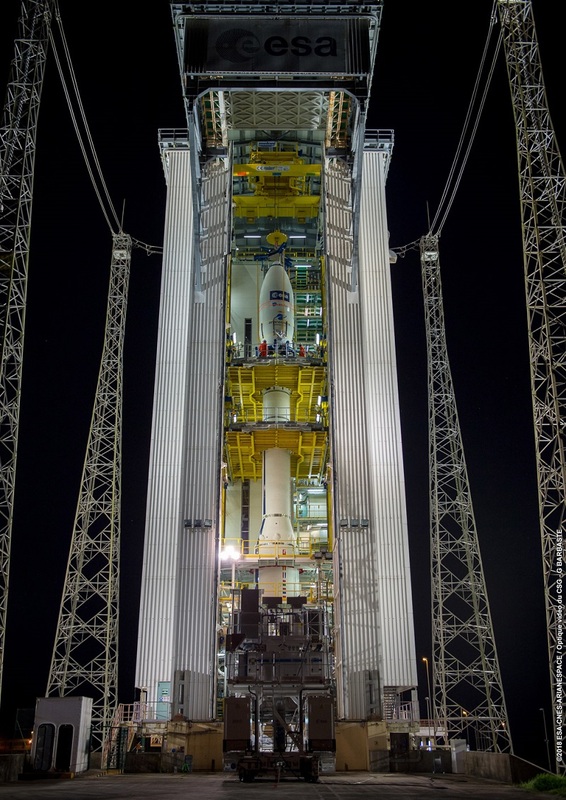 The satellite will be launched by Vega rocket and should go into a sun-synchronous dusk/dawn orbit at 320 km altitude. Aeolus will be the first satellite to capture wind-profiles across the planet in near-real time. it was named after Aeolus, who in Greek mythology was appointed ‘keeper of the winds’ by the Gods. It carries a single instrument, the Atmospheric Laser Doppler Instrument (Aladin). This is a Doppler wind lidar that is a combination of lasers, a telescope and a very sensitive receiver system which will measure the winds in the bottom 30 km of the atmosphere. The lasers generate a series of short light pulses in the ultraviolet spectrum at 355 nm, this wavelength is used as backscatter from atmospheric molecules is particularly strong. The return signal of these pulses are captured by a 1.5 m wide telescope and directed towards the receiver. The receiver then measures the Doppler shift of the backscattered signal, including Rayleigh scattering and Mie scattering from aerosols and water droplets. As the scattering particles are moving in the wind, the wavelength of the scattered light is shifted by a small amount. The Doppler wind lidar measures this change, and can then calculate the speed of the wind. Aladin should measure up to 100 wind profiles every hour across 100 km tracks, with an accuracy of 1 metre per second up to 2 km altitude and at 2 metres per second up to 16 km. These measurements should enhance the accuracy of weather and climate models together with increasing our knowledge of tropical dynamics, both of which should help improve weather forecasting. 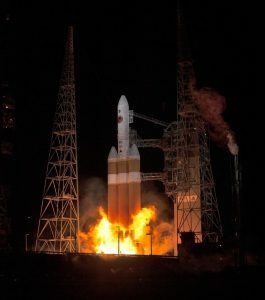 Lift off of NASA’s Parker Solar probe on 12th August 2018. Image courtesy of NASA. Okay, so this is a bit of literary licence, as the fire actually refers to NASA’s Parker Solar Probe mission to the Sun – but I couldn’t help myself with the title! 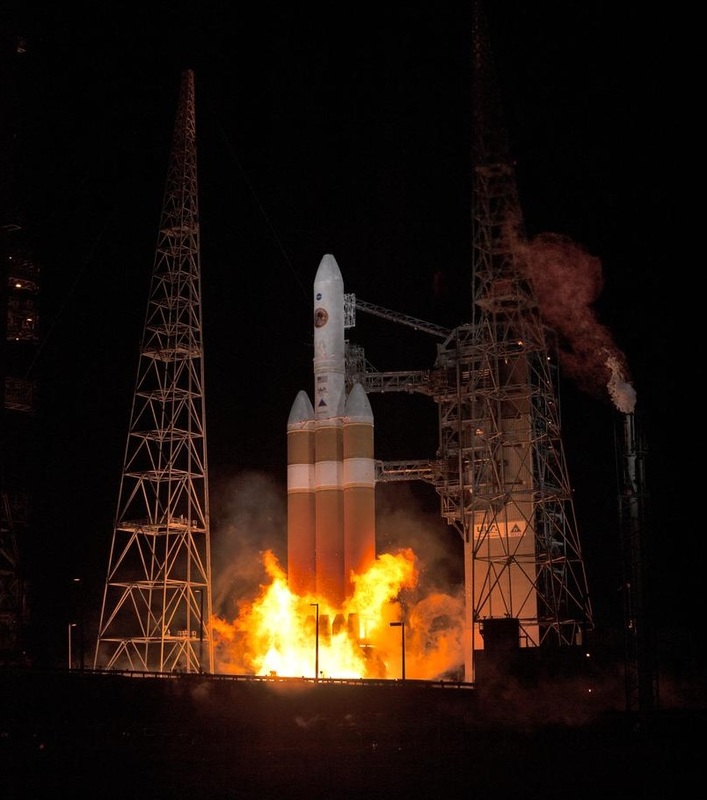 The historic Parker Solar Probe was launched on the 12th August from Cape Canaveral, Florida. It is reported as being the fastest ever man-made object and over the next seven years will make twenty-four orbits around the Sun, the closest of which will be only 3.83 million miles from its surface. Wide-Field Imager for Parker Solar Probe (WISPR): The Probe’s imaging instrument will take images of coronal mass ejections, jets and other ejecta from the Sun to look at the structure of the corona and solar wind. Solar Wind Electrons Alphas and Protons Investigation (SWEAP): Actually, this is two instruments: the Solar Probe Cup and the Solar Probe Analyzers which will measure the numbers, speed, temperature and density of electrons, protons and helium ions in the solar winds to improve understanding of the wind and the coronal plasma. FIELDS: This instrument suite captures the scale and shape of electric and magnetic fields in the Sun’s atmosphere by measuring waves and turbulence in the inner heliosphere with high time resolution. Integrated Science Investigation of the Sun: This is two complementary instruments which together measure electrons, protons and ions to understand where they came from, how they were accelerated and how they move out from the Sun into space. The Probe is expected to make its first loop of the sun, and send data back, before the end of the year. Overall, these three missions show how remote sensing techniques are being used to measure what’s happening on our planet, in the atmosphere and even on stars. This entry was posted in Data, Earth Observation, ESA, Modelling, NASA, Remote Sensing, Research, Satellite, Space Industry, Understanding Space and tagged Aeolus, Aladin, Atmospheric Laser Doppler Instrument, CHEOS, China High-Resolution Earth Observation System, Earth, ESA, FIELDS, Fire, Gaofen, Gaofen-11, high resolution, Lidar, Mie, NASA, Parker Solar probe, Rayleigh, satellite. China. Earth Observation, scattering, sun, SWEAP, Wind, Wind Doppler, Wind Mission, wind profiles, WISPR by Andy. Bookmark the permalink.